Moab is overflowing with rafting companies that take advantage of the wild and scenic Green and Colorado rivers, well above the dams that slow the river's progress further downstream, eventually turning into Lake Powell. The bigger companies stuff school busses full of rafters and pull trailers piled high with rafts, eventually turning into an unwieldy flotilla on the river. We went with a tiny little company, Red River (the old name of the Colorado River), and got that extra personal touch, starting by speaking with the actual river guides when you call them on the phone... a good sign that we picked the right place. They keep it simple by running a couple of small paddle rafts and kayaks and everyone gets a workout, a good way to deal with all the raw teenage energy we bring along. After several years of serious drought in these parts, the river is running very low, so the rapids are pretty mild, probably class 2 at most, along the run known as the Daily or Fishing Towers, which is the starting point. In class 2 rapids no one falls out of the rafts unless they jump or get pushed. Further down river (beyond our route today) after the confluence of the Green and Colorado Rivers, is a wilder stretch known as Cataract Canyon where much more serious class 4 and 5 rapids flow. We'll have to do that another time since once you get in, you're on a 3 day trip. For now, it's good to gain some experience on more forgiving rapids and build some respect for the forces of fast flowing river water. The smaller rapids were still fun and the cool river water was a welcome relief from the near 100 degree heat. The towering walls of the river canyon and surrounding mesas and buttes provided nothing less than a spectacular setting. Our guides, Theresa and David, took us on a special little side trip to an old peach orchard along the river, access to which Red River exclusively has permission. After a couple of hours of paddling and running rapids, we beached the rafts and scrambled up the river bank to the old orchard. 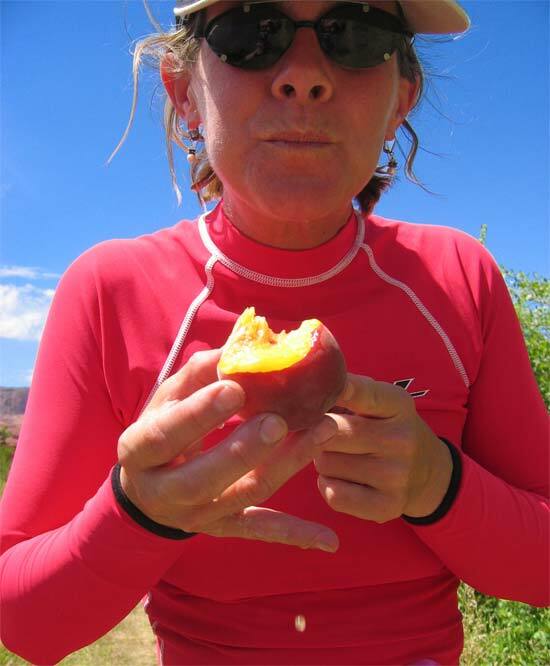 The trees were full of sweet, ripe peaches that literally bursted with juice, running down chin and hands as we each gorged ourselves on a half dozen peaches or more. What a treat!